Aaron Loh, my nephew who’s based in Perth, is now in South India with his university course mates for a 4-week practical stint with a medical college there. Three and a half weeks ago they arrived in Tiruchirappalli, a city fondly called Tiruchi or Trichy, situated more than 300km south of Chennai (formerly Madras). Besides being busy with his course activities, Aaron has been updating the family with his adventures and experiences while exploring the sights in Trichy. We are enjoying the use of modern technology which is making it very convenient for him to post photos and updates for us to keep abreast with what he’s up to. Their accommodation is provided in the college campus but on weekends, they would move into a hotel in the city. This gives the group the opportunity to experience the city as well as food at the hotel and city restaurants. Clearly a fan of South Indian cuisine, Aaron had his fill of vadai, idili and appam, both from hotel restaurants as well as freshly made, from street vendors. During weekdays the college provides their meals and Aaron shared with us his amazement when he first collected the group’s tiffin meal from the delivery van! Tiffin is the Indian custom of eating a light meal for afternoon tea. We are used to seeing our traditional tiffin carriers that are usually stacked with three, or at the most, four bowls. But Aaron was pleasantly surprised to receive a tall tiffin carrier of five bowls, with the bottom bowl being the largest! Check out the size of that tiffin carrier! It surely looked like a lot of food in that tall tiffin carrier and I was curious enough to send him a quick question to ask if that tiffin portion was for one or to share. My curiosity was satisfied by his reply that this was a portion enough to share with the group! While Aaron is familiar with Indian culture and cuisine, it’s a whole new experience for most of his Aussie course mates and he’s having fun introducing it to them. Aaron has the company of course mates like a Singaporean girl and a few Aussie friends who are a bit more adventurous to join him to explore and experience the local culture and cuisine in Trichy. Sometimes accompanied by their coach driver, who also helps with language translation to communicate with the locals, Aaron even ventured to eat a meal at a local restaurant and drink chai, Indian brewed tea, from a street chaiwalla. While South Indian food is traditionally served on sheets of banana leaves, the humble restaurant he visited served their meal on what looked like pieces of greaseproof paper! In his free time, Aaron explored the neighbourhood and could not resist taking selfies and we-fies at interesting sights to post in his Instagram page under #GoGlobalIndia16. Enjoying a South Indian meal, eating with hands! He's clearly having much fun taking selfies, with sights like a lady farmer working in a field and even with a herd of cows wandering on the streets! Born in Johor Baru, Aaron and his brother, Andrew, are football enthusiasts who stay in close touch with local football news, in particular on the achievements of Johor’s popular football club, JDT. Imagine Aaron’s surprise on one of his excursions around Trichy, when he spotted a boy wearing a familiar matching set of shorts and T-shirt printed with the JDT Southern Tigers logo! Check out the JDT Southern Tigers logo on this boy's outfit! The boy’s confusion is obvious because he must have been absolutely puzzled as to why this foreigner wanted to pose for a photo with him – and even deliberately adjusted his outfit to show off the JDT logo! It looks like Johor’s football club merchandise is really going places – even turning up at the Trichy countryside! Thanks Aaron, for sharing with us some fascinating scenes of South India! Tasked with the responsibility to source for a suitable site for our annual church retreat, the search finally ended with a choice of a container hotel experience. with an App and then it went viral! After considering the various options, the organising committee agreed that it will be fun to stay in a hotel designed in recycled containers for the 4-day 3-night retreat in September. So I joined members of the committee on a day trip to Muar recently for them to recce the hotel facilities and get acquainted with the town for more ideas to plan an exciting retreat programme. Muar has its local attractions and street food must be one of them! With an appointment fixed with the hotel at 12 noon, our group enjoyed a leisurely drive from Johor Baru to Muar. As we whizzed our way along the North-South Highway, the conversation inevitably moved to plans for brunch before the appointment. I was ready to be surprised by what they proposed to eat and as I listened to the chit-chat, I learnt that we were going to have bak-kut-teh or pork ribs in herbal soup. While I’m not a fan of rice for brunch (rice is a staple item with this meal), I know I can always have only half a portion. So I went along with their choice. HJ, whose dad’s hometown is Muar, was the appointed leader for our food trail – as recommended by his dad – and I saw him sweating a bit because he was rather unsure of where this bak-kut-teh place was! With our appetites kindled and our palates longing for a taste of this highly recommended meal, HJ was probably feeling the pressure of getting us to this place without delay. All the tables set out in front were occupied! He’s been there with his parents but was unsure of where it’s exact location. We quizzed him to jog his memory for any landmarks so that we could also keep a look-out and help to find this place. HJ described it as a shop within a row of shops by the road with a church opposite. This was as much info as he could offer so with stomachs growling, we kept a keen look-out for these landmarks. We were driving towards Muar along Jalan Salleh and suddenly HJ let out a yell when he spotted the Church of St Andrew. We rarely ever hear a raised voice from HJ so our attention was totally riveted once we heard that sound! Only one stall was serving food and there was a crowd eating around tables set in front of the row of shops opposite that church. So this must be it! This was indeed the place. The discoloured signboard read: Kh’ng Kee Restoran, and the vendor at the stall in front, was busy serving a throng of customers. At a glance, I saw all the tables occupied so we had to patiently wait until a group left before the table was cleaned for us. The space in front of the shops was cast in the shadow of the rising sun and provided enough light with plenty of shade for the bustling business. Enjoying our Muar bak-kut-teh brunch! While waiting, I made a quick survey of the stall and spotted a variety of meat cuts heaped in big bowls and a row of claypots simmering with meat and soup, on flaming stoves. As far as I could see, the items to choose from were chunks of pork belly, ribs and tripe among other innards like liver and intestines. Diners here seemed to be regulars who knew exactly what was on the menu and what they wanted to order. By the time the busy waiter came to take our order, HJ knew what to order and just said the portion was for a certain number of people. By this, the vendor should know how to serve the claypot in a small, medium or large portion. The serving staff also seemed to know their duties, clearing tables, serving tea and plates of dough stick slices. Customers were just coming in non-stop, probably because this was a popular stall and weekenders simply had to have some bak-kut-teh to kick-start their day! I was glad we had already placed our orders because the tantalising aromas was making me feel rather hungry. It didn’t take long for our claypot order to be served, bubbling and steaming hot from the stove. The waiter was back to ask for the number of bowls of rice we wanted and I quickly said that I only wanted half a bowl. All conversation ceased as we hungrily tucked into this delicious bubbling broth. We had agreed that this was to be the first in several small meals on this trip but I guess the taste was so good that everyone finished all their rice and soup rather quickly! By the time our claypot was empty, the sun had risen so high that its rays was already cutting into the shaded area. It was getting warm and just timely that we were ready to leave and head on to find some local coffee. When in Muar, we must taste Muar’s renowned Sai Kee 434 elephant bean coffee. We found our way to Jalan Maharani and parked along that row of shops opposite the main market. I remembered that this required parking tickets and it was very handy that the nearby provision shop also sold parking tickets by pieces, so we bought enough to use for the day. It was not just the coffee connoisseurs among us who were thrilled with the fragrance that enveloped us when we stepped into the double-shoplot café. We simply paused to enjoy the delicious aroma of freshly ground toasted beans and fresh brews being served to customers. Then the waitress had to wait for us to figure out the list of coffee choices in the menu before deciding on the orders. Some preferred kopi-O while others chose the Muar 434 white coffee specialty and the others just wanted iced-coffee because they were warm and thirsty. The kopitiam experience is not complete without some kaya toast so we ordered a variety to share. I also placed an order for Muar’s mee siput just for the others to have an experience of this local snack. “What? Mee siput as in snail noodles?” I was asked in a tone heavy with disbelief. “Yes,” I calmly replied. “It’s even served in a bowl with snails on it,” I said, with a straight face. Curiosity got the better of them because even though they were already full, they still wanted to see and sample this Muar specialty! When they saw the mee siput, they sat back with a sigh and much eye-rolling because this popular local snack was a dish of crispy noodles with a side of sambal dip, served in a ceramic bowl designed with snails on it! Well, I did tell them that it was served in a bowl with snails on it! *wink-wink! With stomachs comfortably full, we enjoyed a short walk along the row of shops to observe the traditional tradesmen doing business and the interesting façades of several Chinese clan houses here. Mindful of the timing for the parking tickets and our appointment with the hotel, we found our way back to the car and headed to the PPT Muar Hotel. We were taken on an inspection of the facilities, particularly the meeting room and family-size bedrooms ingeniously designed within recycled containers and saw how these would do very well for our coming retreat. Since my previous stay with the hotel, they have added more facilities like a sauna and a gym as well as a Japanese restaurant. After a brief discussion on the catering plans, we left the hotel with the necessary information for the committee to agree on the final details before making the arrangements with the hotel. With our mission accomplished and the scorching sun beating down on us, we agreed that some thirst-quenching refreshments should hit the spot. So it was again up to HJ to point us to the nearest watering-hole that served freshly made shaved ice desserts. If not for the iced drinks, which may have helped to cool us down for a bit, we probably would be almost fried in the blasting heat when we walked over to our last stop in Muar to buy home some quality otak-otak, a local spicy fish paste specialty. A worker was toasting the coconut-leaf-wrapped strips of otak-otak on an electricity powered grill outside the A-Class Otak-Otak products shop, and I couldn’t help but imagined him being roasted by the natural heat as well as the heat from the grill! The staff here are well-trained and familiar with their products as they quickly promoted the range to us and deftly wrapped up our orders in layers of old newspapers to preserve the frozen products for our onward journey. This is clearly a regular stop-over for Muar visitors as the staff are familiar with how they would usually buy sufficient stock and require it to be properly packed. On our return drive, I thought that our day trip to Muar turned out to be quite eventful and fulfilling. Not only did we accomplish what we set out to do, we also enjoyed ourselves in good company with a taste of some Muar local food. And even bought back a Muar specialty, packed in its frozen form, to savour later. A foretaste of what Muar has to offer has given us yet another good reason to join the church retreat later this year, where we will spend a few days together, discovering more from our fellowship and exploring the charms of Muar. DoubleTree by Hilton Johor Baru and Angry Birds Activity Park Johor Baru recently announced a strategic partnership to welcome guests to a family vacation experience with the launch of their Angry Birds Adventure Package, which is available until June next year. The promotion includes guest room accommodation at DoubleTree by Hilton JB with buffet breakfast for two adults and two children at Makan Kitchen and two tickets to Angry Birds Activity Park JB. The first 25 guests to book the Angry Birds Adventure Package with the hotel will also receive a set of exclusive Angry Birds and DoubleTree by Hilton JB’s plush toys. “DoubeTree by Hilton and Angry Birds are global brands that share the same brand values and we invite travelers in the region to take advantage of the hotel’s Stay & Play packages,” said Angry Birds Activity Park JB, general manager, Tony Lika, who believes in the adage that families who play together, stay together. “When the park opened in Johor Baru in 2014, we invited Angry Birds fans to visit and have some fun with their families,” he added. In 2014, Angry Birds clinched the award for the World’s Best Game and in 2015, the game was downloaded some three million times. When Angry Birds the Movie opened this year, it was a box-office success. Angry Birds Activity Park is an indoor theme park created on level 3 of KOMTAR JBCC, just a short walk away from DoubleTree by Hilton JB. Inspired by the Angry Birds game created in 2009, this state-of-the-art activity park is designed with fun-packed games and activities suitable for guests ranging from toddlers to young adults. Some of the games and fun attractions include the Anti-Gravity Trampolines, Classic Tower Play that features a foam pit, Laser Maze Spaceship challenge, Shooting Gallery, Go Kart, Space Drop Airbag and even a Sand Castle Ball Pit for children. “We are thrilled to be the official hotel partner of Angry Birds Activity Park JB and are confident that our partnership will add value to leisure travellers who are seeking a distinctive family vacation experience,” said DoubleTree by Hilton general manager, Simon McGrath. “At DoubleTree by Hilton, creating positive connections and experiences with the community is a key component of our CARE (Creating A Rewarding Experience) culture and we look forward to truly living the CARE culture alongside the team at Angry Birds Activity Park,” he added. This partnership also includes a commitment to make a greater impact on the local community through joint corporate social responsibility initiatives. The hotel enjoys a close relationship with Angry Birds Activity Park through the hotel’s “Teaching Kids to CARE” programme. One of its recent collaborations was a charity luncheon hosted by Malaysian Red Crescent JB for a group of Non-Communicable Illness children from Hospital Sultan Ismail with a special performance by Red, the Angry Birds mascot. For five days, classical music connoisseurs in Johor Baru were taken on a musical journey by world-class musicians in the JB Classical Music Festival. Organised by the Johor Society for the Performing Arts (JSPA) under the Johor Baru International Festival City initiative, the festival from June 15 to 19 was held in four venues in and around the city for performances, talks, competitions and masterclasses. The festival aimed to introduce world-class talents to JB and introduce JB’s aspiring musicians to the world. Main sponsor, R & F Princess Cove, hosted the first show in its elegant sales gallery at Tanjung Puteri. My Ladye Loves, a musical narrative commemorating the 400th anniversary of Shakespeare’s death, was presented by Charivari Agreable with Professor Datuk Dr Ng Kah-Ming on harpsichord, songs and recitals by Isobel Collyer and Layil Barr on recorder and viola. This elegant evening was graced by Permaisuri Johor Raja Zarith Sofiah Sultan Idris Shah and the festival’s royal patron, the Johor princess, Tunku Tun Aminah Maimunah Iskandariah Sultan Ibrahim. “People always say that classical music is old and outdated, but good music doesn’t have an expiration date,” said the festival’s content curator, Jonathan Oh. The performances and events over the next three days were held at the auditorium of Afiniti Medini and the Mall of Medini at Iskandar Puteri. Oh, who plays the cello, is a member of the Sutera Ensemble, with violinist Angel Lee, pianist Loo Bang Hean and Dr Andrew Filmer on viola. This group of musicians set themselves apart not only as performers but also as educators and communicators. Their presentation of Camera Sutera – an Evening of Musical Snapshots, was particularly enjoyable as they connected with the audience with an interesting, informative and often hilarious, commentary by Filmer. Fans of the Spanish guitar were serenaded by Sara Guerrero with a repertoire of seven pieces in Saudades Y Danzas. She captivated the audience with her renditions of pieces by Roland Dyens, Manuel Maria Ponce, Jose Luis Merlin and Joaquin Rodrigo. Her set ended with clean, beautiful tones and colours in Joaquin Malats’ Serenata Espanola – a rich, powerful composition with anger, sadness and impotence as well as celebration. The audience was moved by the music by Vienna-based Duo Aliada, which displayed great potential in the unique combination of two somewhat neglected instruments – the saxophone with the accordion. In New Colours of the Past, Michal Knot on saxophone and Bogdan Laketic on accordion, presented a new approach to classical music in a risky but exciting show. Knot clarified that he was playing the soprano sax, an instrument that was often mistaken for a clarinet, and explained the similarities of the saxophone and accordion, which produced sound using the same principle, that was via air. On the fourth night of the festival, Ensemble Virama presented Vienna, Vienna, Vienna – Arnold Schoenberg’s Vienna, with Lim Soon Heng as narrator. The theme of love was effectively portrayed in each piece: Love of friendship in Strauss, loss of love in Mahler and love as forgiveness in Schoenberg. After soprano, Tan Sin Sim, sang the solo part of G. Mahler’s heart-breaking Songs of a Wayfarer with passion, the ensemble concluded their performance with a soaring interpretation of Johann Strauss’ beautiful Kaiser Walzer or Emperor Waltz. On the final night of the festival held at Pinewood Iskandar Malaysia, the Malaysian Philharmonic Orchestra (MPO) made its long-awaited return to JB and played to a full house graced by royal patron, Tunku Tun Aminah Maimunah Iskandariah Sultan Ibrahim. Conductor, Ciaran McAuley, led the MPO in a repertoire of Mendelssohn, Schumann, Rimsky-Korsakov and closed the festival on a high note with guest soloist, Florent Audibert, who performed Dvorak’s Cello Concerto in B minor, Op. 104, B.191. “The strong support from fans of classical music is very encouraging and I’m sure we will have another classical music festival,” said JSPA founder, Yap Siong Cheng, after the show. Meanwhile, the next arts festival in JB is the Indigenous Festival in August which promises an exciting array of performances, exhibitions and workshops. An interesting programme of activities was planned for the event that included music, dances and performances by the SIGS band and SIGS Drum Line. The event was well supported, with ticket proceeds going towards buying new uniforms and musical instruments for the band. With a 45-year old history in JB, the SIGS marching band is renowned at school, state and national events with their smart uniforms and exciting performances. This fund-raising event was organized by members of the SIGS Band Club, with the help of the school’s Music Education teacher, Rohazuddin Hassan. 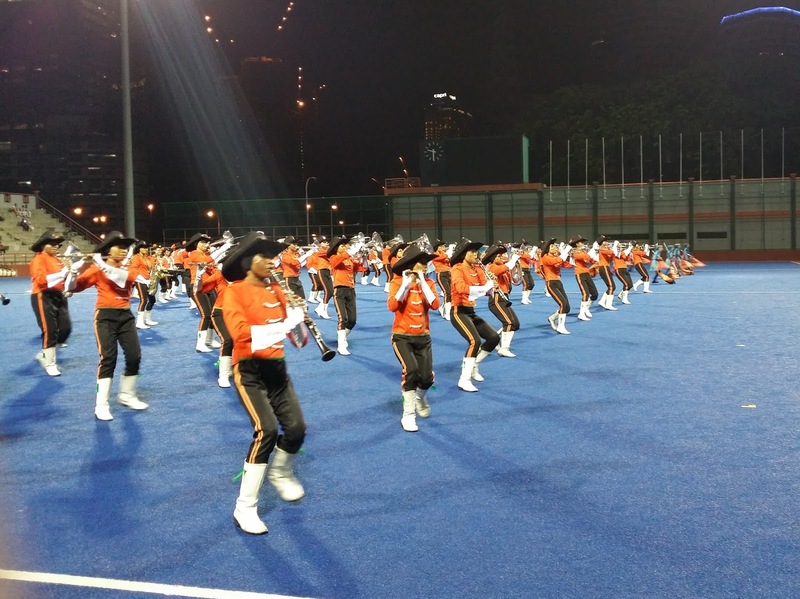 The band’s drum majorette, Nur Emilia Huda Mohd Yunos, 17, shared some information about the band’s proud heritage. The birth of the SIGS marching band is attributed to Mrs Dawn Parry, the school’s headmistress from 1960 to 1987. In 1956, Parry joined SIGS where she taught History and English. She went on to become Senior Assistant and was promoted to headmistress in 1960. It was a new dawn for SIGS as she became the driving force that propelled the school to new heights of achievements over the next 28 years and made her name synonymous with SIGS. Besides upgrading the school premises and facilities, she gave the school a national image not only academically as a premier school but also through its award-winning school band and choir. In April 1971, a fun fair was held, with funds raised going towards the start of the school band. The SIGS band made news in 1981 when they emerged the champion at the National School Bands Competition. In the early years, the band had only 46 members with 17 types of musical instruments and performed music with spectacular synchronised movements. The invitation to participate in the national day celebrations every year since 1981 was proof of the nation's recognition of its talent and superior standards. Throughout its 45-year history, the band has consistently won numerous achievements at national and international competitions. In 2009, the band won the Silver award in the Street Parade Kuala Lumpur World Marching Band Competition and the Bronze in the World Marching Band Competition in 2010. For the 2011 World Marching Band Competition, the band won a Silver award. The band gained much experience and confidence when they performed in annual national and international events including carnivals such as the Carnival of Drums in Singapore, National Day parades, games half-time shows, as well as a school exchange programme in Japan. 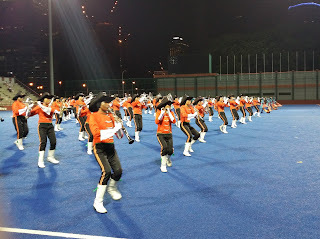 In 2014, the band clinched the Silver award in the international level Street Parade Marching Band Competition at Dataran Merdeka in Kuala Lumpur. But its most memorable and proudest achievement to date must be winning the Gold award as champion of the Kuala Lumpur International Youth Marching Band Competition that same year. Emilia recalled how the band felt like underdogs when they faced competing school bands from Indonesia and Taiwan, and even local bands from Victoria Institution and Sultan Abdul Hamid College. “As we watched the others perform, we never thought could do it,” said Emilia, who fondly remembered their jubilant response when the SIGS band came in second in the preliminary rounds. It was clearly the band’s passion, commitment, discipline and potential that led it to emerge as champion in 2014. As a Cluster School of Excellence, SIGS receives an annual allocation of funds from the Education Ministry for the band but the sum is insufficient. Its consistently good performance has driven the band to aim for greater heights of achievement. But it is unable to achieve high scores in international competitions as it does not have its own pit percussion instruments. The Charitea event was then organised to raise funds for the band which now has 125 active members with sections for woodwind instruments, brass, percussion, pit percussion and the colour guard. The cost of the pit percussion instruments is estimated at RM400,000 while another RM300,000 is required for new uniforms and musical instruments. “Next month, the SIGS band will participate in the World Championship Marching Show Band competition in Putrajaya. We will take our performance to whole new level,” said Emilia. “New instruments will lift our performance and we are hopeful that parents, supporters and the school alumni will lend a hand to help us realise our dream to achieve greater success for the school and for Johor,” she added. Raising such a large sum of money is an immense task that some of the parents of band members have undertaken. They observed how these girls commit themselves to spend at least three hours practicing daily after school. Even those facing important examinations like PT3 and SPM are putting more effort in maintaining their academic and co-curricular activities at top level. As it’s a short time before August, they often burn the midnight oil to keep abreast with studies and sleep hardly five hours a day. “Even though they spend much time marching on the field and practicing with the band, it is encouraging that they have made their parents and teachers proud by achieving consistently good results,” said Fauzidah Abdul Rahman, mother of Nurul Alya Zakariah, 17, a trumpeter in the band. Together with the parents of other band members, she formed the SIGS Band Club or Kelab Pancaragam SIGS, and registered it as a society, with Basri Abdullah as chairman. Fauzidah, a lawyer by profession, aims to maintain a proper legacy for the band as the club properly accounts for the collection of funds and its use. During the mid-year term holidays, a band camp was held from May 25 to 29 to prepare the band for the coming competition. Band members sacrificed their holidays to train together with a high level of commitment and determination to excel in this unique combination of sports and art. A group of five instructors were invited to train various sections of the band including honing their skills in synchronised marching and formations, playing musical instruments and the choreography of the colour guard. “SIGS is one of three schools representing Malaysia in this coming international competition with up to 20 participating nations,” said Syed Khairuzman Syed Zain, who has been training the band in the last five years. While the marching band was formed in 1971, the colour guard or flag spinning, was only added on in 2011. In marching band competitions, the performance of the colour guard adds to the overall score of the band. The colour guard will accompany the band, wielding various instruments like flagpoles, rifles and sabres, in a choreographed dance routine to express dynamic passages in the music. The band members trained under the scorching sun, holding and playing their musical instruments, practicing and memorising the various formations in the field. Each girl must be physically fit to perform as an athlete and artiste. For more information on SIGS Band and to donate, email: sigsband99@gmail.com and komunitibandsigs@gmail.com or Tel: 017 – 7583758. The lush production of Tun Seri Lanang The Musical explored the history and heritage of Johor. The venue was packed during the two-night run of the 135-minute musical. The first show was graced by Johor Menteri Besar Datuk Seri Khalid Nordin. The musical was directed by On Jaafar, who had helmed six productions at Istana Budaya in Kuala Lumpur. Staged at the Persada International Convention Centre in Johor Baru recently, it was presented by Yayasan Warisan Johor (YWJ) or the Johor Heritage Foundation. At the media launch for the show (held earlier at the Museum Kota Johor Lama at Kota Johor Lama, the seat of the early kingdom of Johor), he explained that this production was not a portrayal of the biography of Tun Seri Lanang. Instead, it charted how he transformed from a captured prisoner-of-war to King of Samalanga in Acheh. This show featured various interesting historical scenarios from Batu Sawar near Johor Lama to Acheh where some 23,000 captives were taken from Johor in the 1613 Achinese attack. A scene in the court of Sultan Iskandar Muda Mahkota Alam of Acheh showed how he aimed to make Johor disappear from the map by his decree that the captives must dress and speak like the Achinese. Faced with the danger of losing their Johor identity, Tun Seri Lanang appealed to the sultan and it was the compassion of his permaisuri or queen. She sought to advise the sultan on a better way to strengthen their nation, not by force of a decree but by integrating the two nations through inter-marriage. On took the liberty to create the character, Komeng as Tun Seri Lanang’s pembantu or helper, who linked the story with his narration and also provided comic relief in a somewhat tragic segment of Johor history. Through a series of events, Tun Seri Lanang escaped the evil plot of the Orang Pembesar or nobles in the Acheh court, who planned to have him drowned at sea. The musical came to a climax where he was ultimately installed as King of Samalanga. Presented on a wide stage with a multi-tier design, the actors were accompanied by a live ensemble of musicians playing contemporary instruments like the keyboard, string and wind instruments along with traditional drums and a choir. The dialogue was in Malay with selected scenes that saw characters speaking in classical Malay and pantun or poetry. Scenes changed rapidly as the story unfolded with live music, dances, traditional costumes and historical characters. The 149-strong cast and crew were made up of mainly Johorean talents. They included actors, musicians, dancers, the choir as well as the crew involved with stage design, props, costumes and audio and visual technicians. The script was the joint effort of writers, Shaq Saini and Man C. K while the musical director was Hanizam Hassan. Rohayu Yusof and Sufian Hassan were in charge of dance choreography. The lead actors in the cast were Datuk Jalaludin Hassan as the main character, Tun Seri Lanang, Ungku Ismail Aziz as Sultan Iskandar Muda Mahkota Alam, with Bell Ngasri in the role of Komeng. Raja Ilya played the role of Puteri Pahang while Azizah Mahzan was Pucot Maelingoe, admiral of the Achinese fleet responsible for the attack on Batu Sawar with an 80,000 strong army in 1613. There was a sense of achievement after the show ended, when renowned composer, Datuk Suhaimi Md Zin, gave encouraging comments on the music, compositions and arrangements. Academician and cinography practitioner, Hamzah Tahir, also praised the good music and acting. The cast taking a bow at the close of the show! “Tun Seri Lanang the musical is the beginning of a very promising future for musicals in JB,” said On, who was upbeat about the performance and how the state government was keen to develop the arts and encourage more youths to be involved. “I certainly wish to take this show further and perform it in a bigger theatre to a larger audience, to share more about Johor history and showcase the spectacular talents on stage and behind the scenes,” he added.